Shares of South Korea’s hotel and resort operator Ananti Inc. rallied Tuesday upon news that one of its board directors and legendary investor Jim Rogers will be visiting North Korea next month on an invitation from North Korean leader Kim Jong-un. Ananti is the only firm in the world that owns management rights of a resort in the North. On Tuesday, shares of Ananti on the nation’s secondary Kosdaq market finished 0.2 percent higher at 25,550 won($22.73) after hitting as high as 28,900 won($25.70). Neither Ananti nor Rogers has confirmed the report. Rogers, an American businessman and iconic Wall Street name along with Warren Buffett and George Soros, has been showing a great interest in investment in North Korea for years. 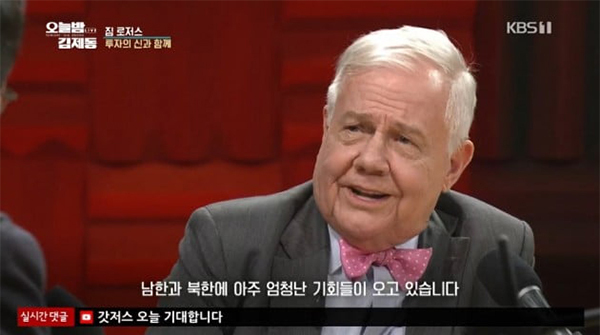 He appeared at a Korea TV Show ‘Tonight – Kim Je-dong’ last month and said Korea “is going to be the most exciting country in the world for the next decade or two, and added that investing in North Korea carries “less risk” because everything is so cheap now. He also joined Ananti as an outside director last year. Ananti in 2008 opened a luxury resort including an 18-hole golf course and spa in Mount Kumgang after leasing a 1.68 million-square-meter area from Hyundai Asan, who has an exclusive right to carry out infrastructure projects in North Korea. The resort remains closed after the Mount Kumgang tours were halted two months later following the fatal shooting of a South Korean tourist by a North Korean soldier.